This genus is accepted, and its native range is W. Australia. Annual. Culms decumbent, or prostrate; 4-35 cm long. Ligule a fringe of hairs. 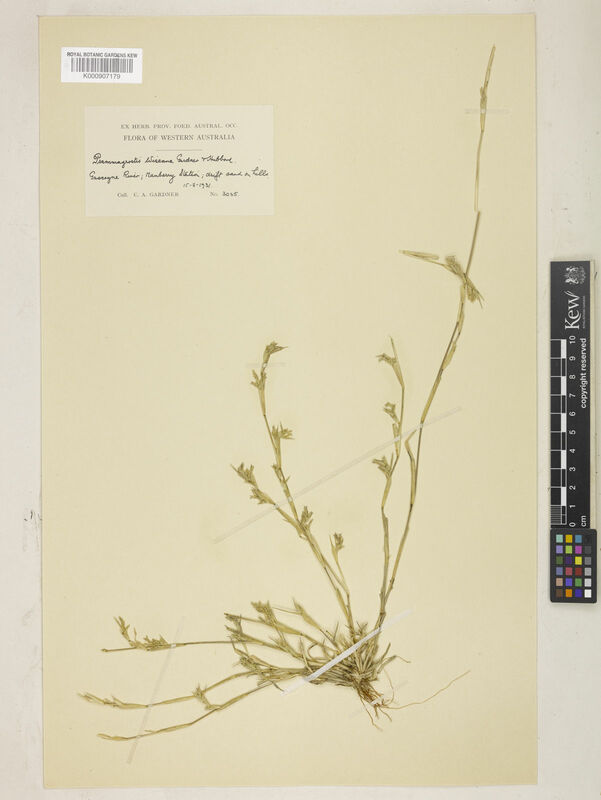 Inflorescence composed of racemes, or comprising only a few spikelets; terminal and axillary; deciduous as a whole; subtended by a spatheole; embraced at base by subtending leaf. Spatheole lanceolate; herbaceous. Peduncle widened at apex; disarticulating. Racemes single; unilateral; bearing 1 spikelet, or few fertile spikelets; bearing 1-3 fertile spikelets on each. Rhachis flattened. Spikelets solitary. Fertile spikelets sessile. Spikelets comprising 3-7 fertile florets; with diminished florets at the apex. 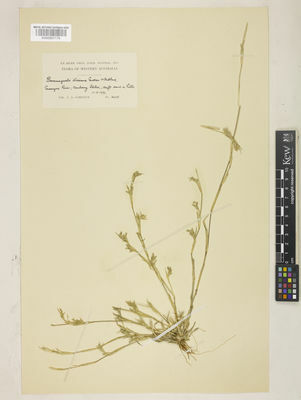 Spikelets oblong; laterally compressed; 4-8.5 mm long; falling entire; deciduous with accessory branch structures. Glumes shorter than spikelet. Lower glume lanceolate; 0.9-1 length of upper glume; membranous; 1-keeled; 1 -veined. Lower glume lateral veins absent. Lower glume apex acute. Upper glume ovate; 1.1-1.3 length of adjacent fertile lemma; membranous; 1-keeled; 3 -veined. Upper glume apex acute. Fertile lemma oblong; membranous; keeled; 3 -veined. Lemma lateral veins ribbed. Lemma apex obtuse; mucronate. Palea 1 length of lemma; 2 -veined. Palea keels scaberulous. Apical sterile florets resembling fertile though underdeveloped. Caryopsis with free soft pericarp; oblong; trigonous. Embryo 0.33 length of caryopsis. Hilum punctiform. Psammagrostis wiseana C.A.Gardner & C.E.Hubb.